-Making City government more responsive to local needs. 2. NC’s that embody the highest ideals of inclusiveness, non-discrimination, transparency, and independence, as detailed in the Plan for a Citywide System of Neighborhood Councils. The Commission will also use its “Neighborhood Councils Rules and Best Practices Guide” as a source of other relevant criteria, and as a tool for measuring and evaluating NC achievements. All certified NC’s that are not in exhaustive efforts as of the date of the determination of the Awards by the Commission are eligible. • Seven Awards will be given annually. • One NC from each of the seven Los Angeles Planning Regions will be given an award each year. • The Commission will solicit nominations for NC awardees from NC board members and participants, Department of Neighborhood Empowerment (“the Department”) staff, and all other stakeholders from throughout the City. • A Committee of the Commission will work with the Department to review all nominations and make recommendations to the Commission, which will make final determinations of awardees. 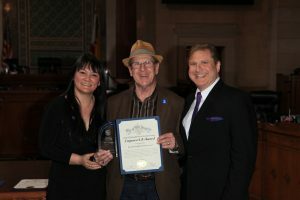 Each year, the Board of Neighborhood Commissioners celebrates the achievements of Neighborhood Councils by presenting EmpowerLA Awards to those certified Neighborhood Councils that best achieve their mission to engage their local stakeholders with government and make their government more accountable and responsive to the needs of their communities. 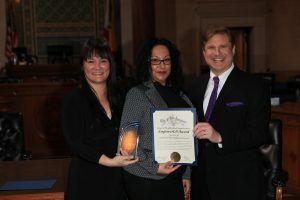 The EmpowerLA Awards were created to highlight the highest ideals of inclusiveness, non-discrimination, transparency, and independence for the Neighborhood Council system. 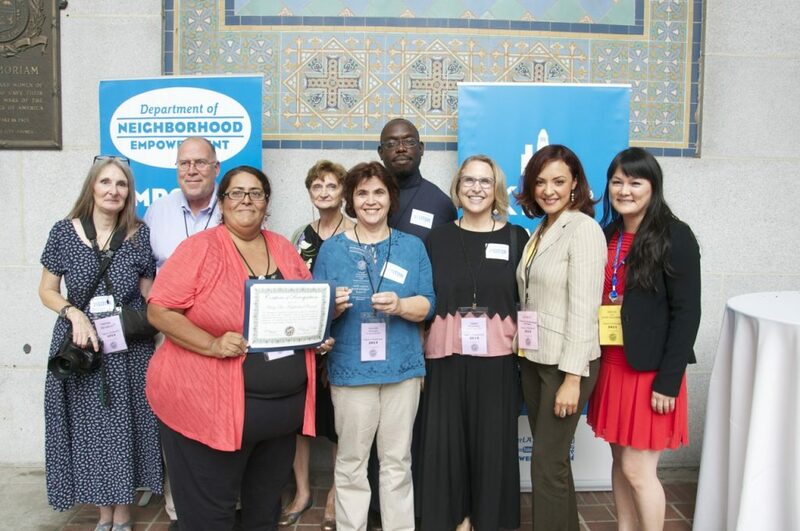 Through the EmpowerLA Awards, the Commission hopes to encourage Neighborhood Councils to be continually elevating the standards and best practices for community engagement, and improving their effectiveness for the coming decades. 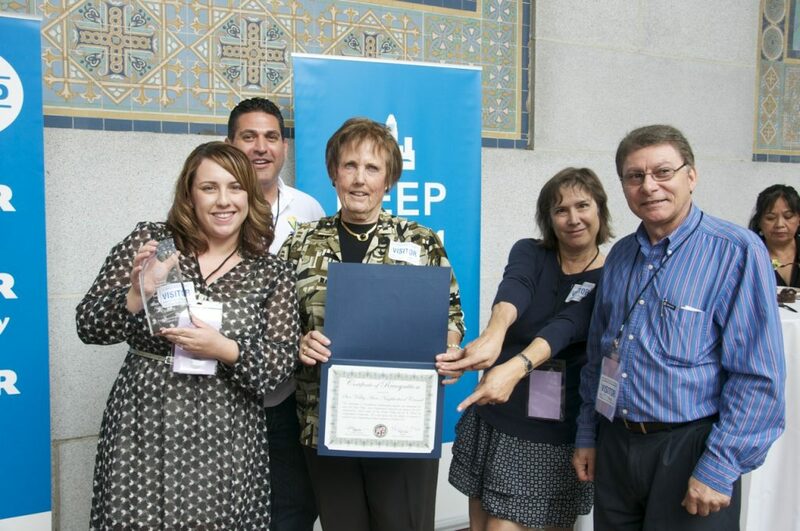 Read the “Selection Procedures” to learn about the criteria for applying to EmpowerLA Awards. To apply, fill out the online form, or print the application and hand it over to your Neighborhood Council Advocate. Congratulations on this remarkable achievement in fulfilling the dual mission of promoting more citizen participation in City Government and making City Government more responsive to local needs with your work in revitalizing Rosewood Garden. Your Neighborhood Council work has embodied the highest ideals of inclusiveness, non-discrimination, transparency, and independence as detailed in the Plan for a Citywide System of Neighborhood Councils. Congratulations on this remarkable achievement in fulfilling the dual mission of promoting more citizen participation in City Government and making City Government more responsive to local needs by hosting an event at Elysian Heights Elementary to provide information to parents of students about their rights as renters. Your Neighborhood Council work has embodied the highest ideals of inclusiveness, non-discrimination, transparency, and independence as detailed in the Plan for a Citywide System of Neighborhood Councils. 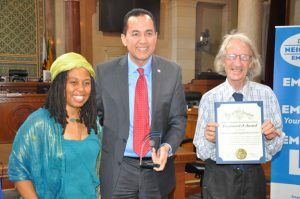 Congratulations on this remarkable achievement in fulfilling the dual mission of promoting more citizen participation in City Government and making City Government more responsive to local needs by working with City Council District 10 in holding major oil companies accountable to the local community, resulting in the City of Los Angeles hiring the first Petroleum Administrator in over 60 years. Your Neighborhood Council work has embodied the highest ideals of inclusiveness, non-discrimination, transparency, and independence as detailed in the Plan for a Citywide System of Neighborhood Councils. Congratulations on this remarkable achievement in fulfilling the dual mission of promoting more citizen participation in City Government and making City Government more responsive to local needs by organizing a Homelessness Town Hall to educate the community about the homelessness crisis. Your Neighborhood Council work has embodied the highest ideals of inclusiveness, non-discrimination, transparency, and independence as detailed in the Plan for a Citywide System of Neighborhood Councils. Congratulations on this remarkable achievement in fulfilling the dual mission of promoting more citizen participation in City Government and making City Government more responsive to local needs by creating a LGBT+Allies Committee to engage and educate the youth and stakeholders in the community. Your Neighborhood Council work has embodied the highest ideals of inclusiveness, non-discrimination, transparency, and independence as detailed in the Plan for a Citywide System of Neighborhood Councils. Congratulations on this remarkable achievement in fulfilling the dual mission of promoting more citizen participation in City Government and making City Government more responsive to local needs by collaborating with the Division of Urban Forestry to remove dying trees and to install a drip system to save additional trees in your community. Your Neighborhood Council work has embodied the highest ideals of inclusiveness, non-discrimination, transparency, and independence as detailed in the Plan for a Citywide System of Neighborhood Councils. 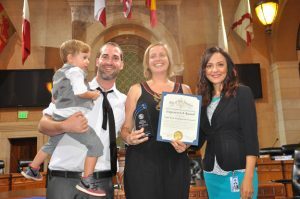 Congratulations on this remarkable achievement in fulfilling the dual mission of promoting more citizen participation in City Government and making City Government more responsive to local needs by creating an environment and community space utilized by thousands of community members and successfully launching a “I Love Reseda” and Neighborhood Pride initiative. Your Neighborhood Council work has embodied the highest ideals of inclusiveness, non-discrimination, transparency, and independence as detailed in the Plan for a Citywide System of Neighborhood Councils. From the North Valley, the Sylmar Neighborhood Council was a creative leader in the “Make Your Horses Count Event.” This event was designed to showcase the equestrian community of Sylmar and help preserve the rural lifestyle of this unique community. As a result of demonstrating the unique lifestyle of this community, The City of Los Angeles has now designated a protected “K” overlay in areas which cannot be broken. This was a tremendous accomplishment and the first of its kind in the entire City of Los Angeles. The Sylmar Neighborhood Council Equestrian Committee joined forces with many other equestrian organizations and horse enthusiasts to sponsor this event and bring attention to the community and advocate for proper zoning for this area. This neighborhood council truly demonstrates how civic engagement based on coalition building can truly make a difference in public policy decision making. From the South Valley, the North Hollywood Northeast Neighborhood Council and North Hollywood West Neighborhood Council rallied around the job of improving a very blighted City of Los Angeles property. The property was seriously eroded with sand eroding over the sidewalk, weeds proliferating, and garbage proliferating, and plumbing pipes were exposed. A clean up had to be organized on both sides of Whitsett Avenue. 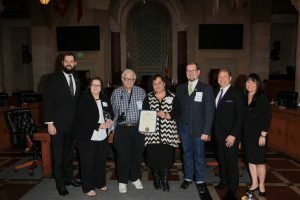 Working with the office of Councilman Paul Krekorian, neighborhood watches and the North Hollywood West Neighborhood Council, an exceptional property upgrade was established. There were clean-up activities, planting projects and mural painting. The unified activities of all organizations involved have transformed a long-time hazardous and blighted area into a water-saving garden and artistic land-mark. The project also helped develop new friendships, and an open awareness how much can be achieved when Neighborhood Councils cooperate with one another. From Central, the Westlake South Neighborhood Council (WSNC) is a true example of a neighborhood council attempting to integrate itself into the community that it serves. This organization has gone to great lengths to recruit board members that represent all races, ethnicities and points of view. The board is comprised of white, African American, Latino, and Iranian-American members. This neighborhood council has organized events and projects that provide service and empowerment to a community of over 30,000 residents. The WSNC has conducted the free Neighbor-to-Neighbor event in MacAthur Park to connect people to the NC, to city services, and local non-profit services. They have also sponsored an Immigration Legal Fair working with organization that involves themselves in immigration rights. There are also the WSNC Days of Service with the goal of beautifying the community and engaging with community members. The WSNC Health Fair has been very helpful to residents who lack basic health care. Approximately 300 people were helped with basic health care needs. This neighborhood council feels that it has also been very prudent in issuing Neighborhood Purpose Grants to organizations providing essential and valuable assistance to neighborhood residents. Also from Central, Mid-City West Neighborhood Council has responded to community constituents requests to create safe routes for bicycling and walking. Mid-City West and stakeholders created a comprehensive plan to create two bike routes: one going east-west along Rosewood Ave.; and one going north-south along Formosa and Alta. The support for this plan led to a meeting and bike ride with city staff. Councilman Koretz nominated the project for Metros 2015 Call For Projects. Subsequently the Mid-City West Project was recommended for funding in the amount of $1,806,765 with a city contribution of $483,629. The project was ranked 7th of 15 bicycle infrastructure projects. This project proves that neighborhood councils can respond to community needs and get big things done through strong and diligent advocacy. From the West, West Los Angeles Neighborhood Council strikes a balance, working effectively with both stakeholders and developers, to ensure a better quality of life and better projects with the community. WLASNC spends $30,000 annually on outreach. They work closely with their council office bridging the gap between the CD office and stakeholders. The NC holds 8 free concerts and movie nights to bring the community together. They recently partnered with NIKE to re-open the skate plaza and do a renovation at the civic center plaza. The West L.A. NC was an integral partner in the renaming of the Sawtelle area into the Sawtelle Japan Town area, recognizing the historic Japanese community. The council does an email blast weekly to their stakeholders to keep them informed of NC business and upcoming meetings. This council has been and continues to be 100% in compliance with funding rules, code of conduct, ethics rules, and spends 100% of its funds, with the vast majority on outreach which helped to increase voter turnout this past year. 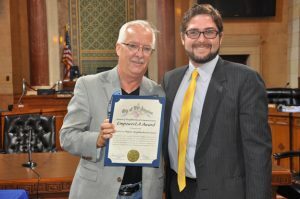 From the East, the Eagle Rock Neighborhood Council is being honored for several reasons. First, this organization has taken a hard look at the structure of their neighborhood council and made some important infrastructure changes. While maybe not useful for all neighborhood councils, the thoughtful consideration put into the structure of their council is highly commendable. They have spent much time disseminating information through their website. Unlike many NCs, Eagle Rock, publishes all agendas and comprehensive minutes from Board and Land Use and Planning meetings. Board resolutions and community impact statements are accessible online. They have a very active Land Use Committee.. This committee has submitted written recommendations on every significant Planning Department case and Conditional Use Permit in Eagle Rock. The NC after research by Planning Committee organized against some over-sized developments, against a 7-11 wanting to sell alcohol. They played a major role in amending the Colorado Boulevard Specific Plan. Their CIS have been well researched and thoughtful, including response to the expansion of the Scholl Canyon dump in Glendale. They held a debate between the major candidate in the recent LAUSD School Board race in District 5. Eagle Rock NC was only one of two neighborhoods in all of L.A. to take advantage of a state grant for tree well cutting that was administered by the Council District which meant that ERNC board members walked the streets of Eagle Rock to plot locations for over 250 new sidewalk tree wells. 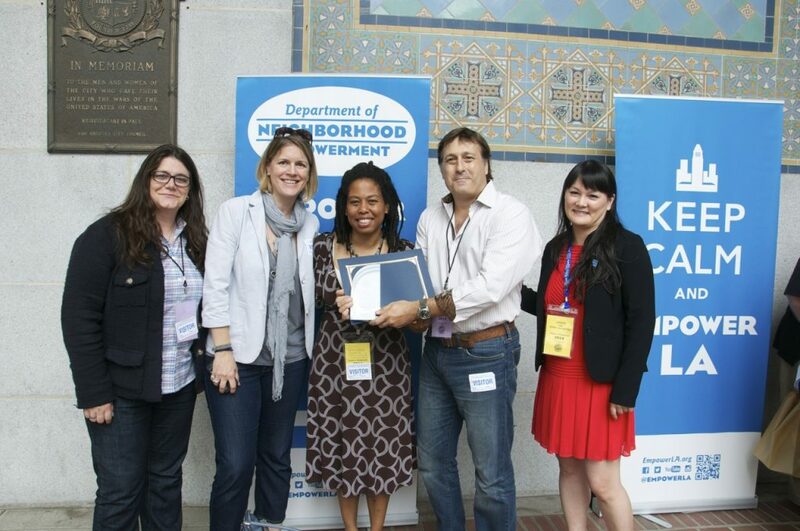 From the Harbor Region, the Harbor Gateway North Neighborhood Council was recognized. On November 8, 2014 the Emergency Preparedness Committee of the Harbor Gateway North NC mobilized 63 block leaders to go door to door in their neighborhoods with small bags of information on how to prepare for a major emergency as part of the NC Emergency Preparedness Neighborhood Survey. A survey was given to residents who were home identifying those who had medical skills, construction skills, and/or own generators or are Ham radio operators. All homes received the bag with information which the Council District 15 staff and the Emergency Management Department helped the NC assemble. 10,000 households received information about the Nov. 8th community walk-through. The surveys given laid the groundwork for sponsoring CERT classes during May and June of this year, the first such classes in ten years. In addition a number of stakeholders began preparing to pass the Ham radio license exam, which was given on July 11th of this year. 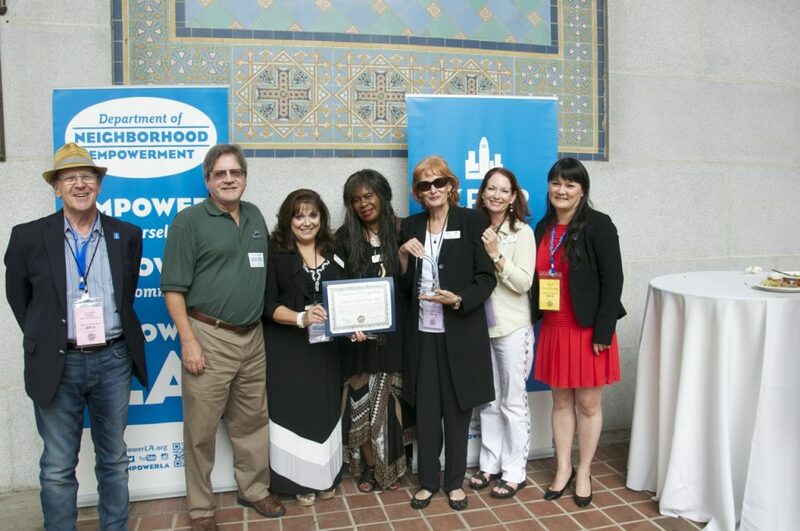 From South LA, Empowerment Congress Southwest Area Neighborhood Development Council was recognized. 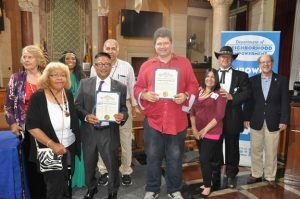 Fulfilling its City Charter mandate to increase civic participation, ECSWANDC made the Council District 8 open seat its mission both alone and in partnership with the South Los Angeles Alliance of Neighborhood Councils (SLAANC). Candidates were featured during its meetings and the final SLAANC Candidates’ Forum was held within its boundaries at Washington Prep HS. Its Strategic Plan mission to increase Outreach included a website redo and an increased Social Media Presence while lowering its expenses and functionality for both. It was one of the first SouthLA NCs to use NextDoor and still uses the media in its Agenda and special event announcements. Sun Valley Area Neighborhood Council is a prime example of creating a community project that involved every aspect of the neighborhood represented. This council created the powerful Neighborhood Pride Day that was a day of rehabilitating homes needing renovations and improvements. The council engaged the city through Neighborhood Housing Services to rehabilitate 3 homes; then the board assessed other homes requesting help and through volunteers of neighbors eleven more homes were improved. The business community was approached to supply goods and services and food for volunteers. This project took vision, hard work, complete cooperation of board members, and a lot of flexibility and determination. A job well done! Valley Village Neighborhood Council emphasized an important aspect of their community, a need to have a strong business center and to grow business support for the neighborhood council. This is an aspect that many neighborhood councils could view as a best practices project. The council initiated a program entitled “Light Up Valley Village.” They first recruited 50 businesses that grew to 99 where these establishments would provide special holiday lighting open the doors of their businesses, providing coupons, snacks, music, and where citizens could stroll the shopping districts in the evening. Why was this project important? Valley Village NC identified 300 known businesses in the immediate area and a strong retail sector all of which can provide a strong economic base for the community. 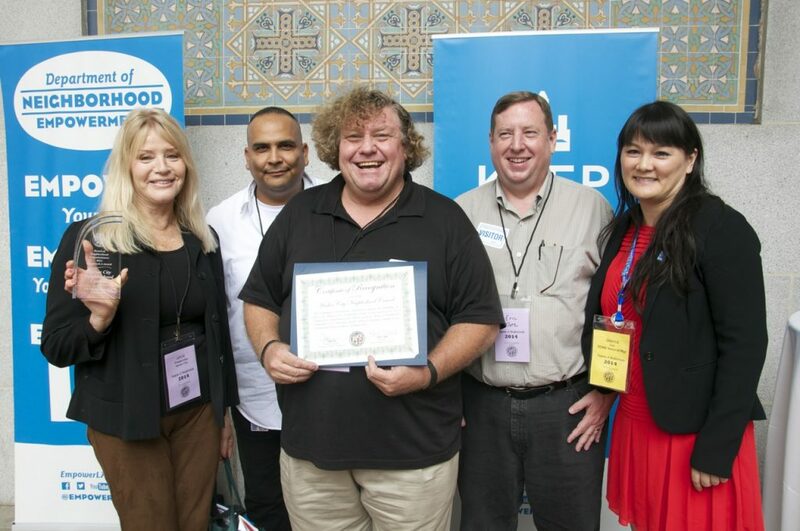 Arroyo Seco Neighborhood Council is considered the turn-around neighborhood council of the year. They have moved forward from low-turn out meetings to standing room only at their regularly scheduled meetings. Outreach has become a prime concern of Arroyo Seco NC. Their council has expanded its participation in community events; has directly hosted their own special events; has actively grown their database of citizen contacts; established regular email blasts; and created a newsletter. It is great to see this neighborhood grow and enhance their capabilities. 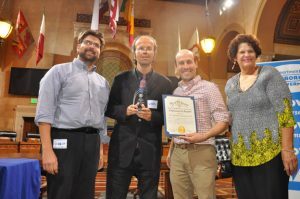 Los Feliz Neighborhood Council is being recognized for it fabulously newly designed website. Their creativity and thoroughness in including important city and neighborhood council business is admirable and is of course a “Best Practices” leader in website design. The new website has an updated calendar of local events and an array community service programs to peruse. An important addition has been the “Survey of the Month” where citizens have the opportunity to voice their opinion on a variety of subjects. This survey interaction with citizens is an important way for citizens to voice concerns and keep in contact with the Los Feliz Neighborhood Council. This website is a job well done. 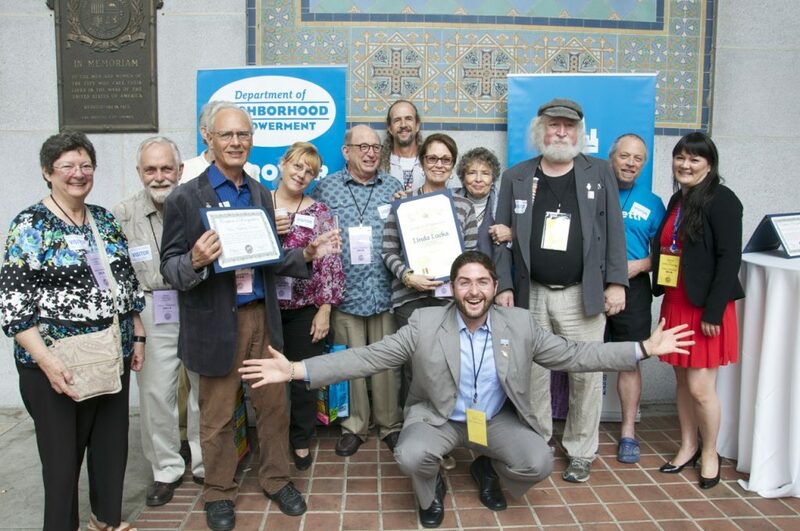 Venice Neighborhood Council has worked hard to become an integral part of the Venice community. Their election outreach is phenomenal and the time spent on recruiting candidates for NC office is extraordinary – the theory being that high recruitment of candidates means increased election turn-out and participation of citizens supporting favorite candidates. Venice NC hosts a yearly Community Bar-b-que; the Great Venice Toy Drive; and invite an array of elected officials to their high profile meetings. This council also has extremely active committees and ad-hoc committees on housing, transportation, the Arts, environment, public safety and Ocean Front Walk. Venice is a Best Practices example of a neighborhood council integrated completely into the community. 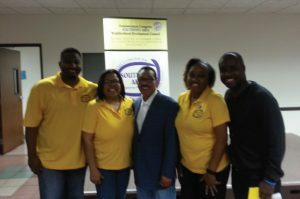 Empowerment Congress West used the neighborhood council election season to orchestrate an all out campaign to reach stakeholders and recruit new board members in the process. Recruitment was done at special events and council meetings. Then the most important strategy was to hold elections in conjunction with the local very popular Farmers Market. This resulted in a 100% increase in voter turnout. This neighborhood council plan for elections could be considered for action in other neighborhood council areas where there are farmers markets, large shopping centers, or activities created in conjunction with elections. Harbor City Neighborhood Council isa great example of a neighborhood council bringing citizens together to address an important public policy issue regarding public safety. This neighborhood council worked with their state senator and assembly representatives, their city council representative, and the State Department of Transportation (Cal-Trans) to arrange funding to build a safety fence along Western Avenue (state highway) to prevent Narbonne High School students from jaywalking across this very dangerous portion of the street. Harbor City Neighborhood Council civically engaged and brought together citizens, students, parents, school staff and politicians to accomplish this task. This council is a good example of an organization that researched a problem, engaged all aspects of the community that could influence the decision-making process, and carried out a plan of action that would help fund this important public safety project. Downtown Los Angeles Neighborhood Council took to heart something President Patricia Berman likes to say: “don’t wait for the City to do something for you; get out there and do something for yourself.” With this in mind, the take-charge group has had a string of public policy successes, most notably the opening of Spring Street Park between 4th and 5th Streets, as well as a two parklets along the same corridor! What is also great is that they are working with ALL the populations of downtown – for example, organizing a high-level Town Hall on the TB outbreak of a few months ago and an ongoing Skid Row resident-led Clean-Up Campaign to address needs on Skid Row. They are helping vulnerable homeless populations in the most powerful of ways– through direct engagement, involvement, and empowerment. 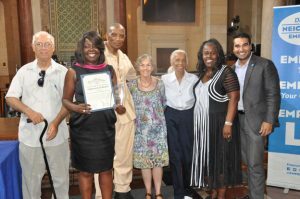 Historic Highland Park Neighborhood Council has worked hard over the past year to elevate its presence and connect with stakeholders in the neighborhood and surrounding areas. They are an inspiration to all Neighborhood Councils struggling to engage their communities. Under the new board leadership, including the very effective President Monica Alcaraz, the community has come out in droves to candidate forums (one offered in two languages), business mixers and meetings where they focus squarely on addressing local needs. Since their stepped-up focus on outreach began, hundreds of people have participated in their activities which they attribute to relevance, savvy social media efforts, and sweat equity invested in getting people to come out. Northwest San Pedro Neighborhood Council has effectively galvanized their community to address the needs of youth. Most impressive was their work to create “Pathways to Employment,” an event in partnership with San Pedro Rotary and Harbor Communities Benefit Foundation to provide this important population with employment skills through training workshops, practice interviews, and presentations by many of the 36 businesses present. In addition to addressing the career needs of youth, they are providing recreational options as well through the soon-to-be-opened skate park at Peck Park, a project which they initiated and worked with the Council Office and Department of Recreation and Parks to realize. Northridge West Neighborhood Council will celebrate three years of Operation Clean Sweep with eight to fifteen volunteers showing up every week on Thursday for four hours to clean sidewalks, parkways, and gutters. How many NCs can boast this kind of consistency in the work to make their community a more beautiful and walkable place? Subscribing to the broken window theory, they have had a big impact on the local crime rate by ensuring their neighborhood is well cared for. Reseda Neighborhood Council’s Economic Development Committee in 2011 began discussing the downward trend in the economy and what sort of community level initiatives could be helpful to small businesses in Reseda. After researching successful small business development efforts across the country, they launched a local program on their own (Spend $25 on the 25th in Reseda). It caught the attention of the citywide ShopLA program and American Express, both of which then partnered with ShopRESEDA. 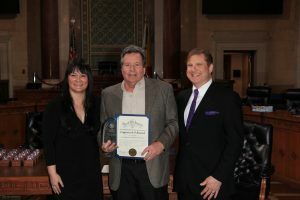 In conjunction with these efforts, the ShopRESEDA Discount Card was launched at a national news conference and now includes 200 local business partners (ShopResedaCity.com). This concept of “shopping local” has successfully encouraged a lasting sense of community pride and spirit as well as encouraging more participants in Reseda’s local economy to engage in the NC process and the greater City. South Robertson Neighborhood Council encompasses several neighborhoods known over the years by other names: Pico-Robertson, Palms (in some areas), and Beverlywood (in others). Building a coherent and recognizable identity out of all the different neighborhoods has been a challenge, but an important one: neighborhoods decay when no one cares. So they have focused on building local community pride by increasing the sense of identity by “branding” the neighborhood as SORO. To this end, they display street banners, which make the SORO name visible, and host the well-attended annual SORO Festival. Most notably, they are sponsoring an innovative partnership with KCET Departures to create a series of video profiles, articles, and photo journals that tell the story of, and strengthen pride in SORO. When plans were made to move the Space Shuttle Endeavor through their communities, four Neighborhood Councils knew it was going to cost them a lot of trees. So Empowerment Congress West Area, Park Mesa Heights, Empowerment Congress Central Area and Empowerment Congress North Area came together as the Space Shuttle Task Force to mitigate the negative impact of the historic event on the neighborhoods, negotiating an agreement that improved the quality of life in their neighborhoods. The number of trees to be cut down was reduced by hundreds and those that were destroyed were replaced four-to-one. In addition they will receive sidewalk repair, money for tree trimming, fifty youth scholarships, and five professional development programs for teachers at South LA schools. 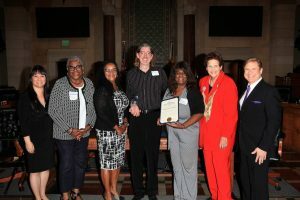 Mid City Neighborhood Council was honored for their work on the Washington Boulevard Improvement, a project that has kept them busy since 2005 improving safety, beauty, and economic development along the corridor. Gang activity went down and crime rates went down by over 50% in the first two years. Graffiti tagging dropped from 189 times per week to less than 10 times per week! The CRA and CD 10, impressed with their results, helped the group gather funding for their goal of a median island, which was completed this summer with community input on design and placement. Harbor Gateway North Neighborhood Council was recognized for their work organizing the community and turning out large numbers of residents to protest the development of land under the freeway, a project that they contended would result in environmental and health issues for the residents. They stayed on it for years and prevailed, convincing the Planning Commission to oppose the zone change. 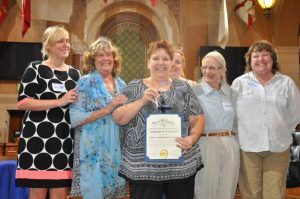 Mar Vista Community Council‘s Green Committee brought home an award for their annual “Green Garden Showcase” that engages the community in the sustainable lifestyle by putting the spotlight on drought tolerant and food producing gardens with a popular tour that connects people with the Council. North Hills East Neighborhood Council was honored for their commitment to bilingual civic engagement and for their ambitious outreach strategies that include professional translation services complemented by social media in English and Spanish to engage their community and to form partnerships with schools, parent centers, non-profit organizations, and law enforcement. 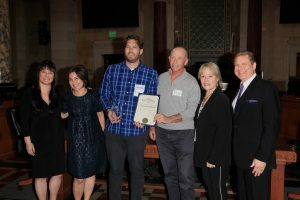 Silver Lake Neighborhood Council received the EmpowerLA award for their work on the Silver Lake Reservoir, a project that started when they heard that the beloved sycamore trees were tagged for removal. They investigated, discovered the DWP’s plan to rip up the park for a large pipeline, and went into action, eventually moving the pipeline to the bottom of the reservoir and saving $20 million in construction costs. Park Mesa Heights Community Council hosts an annual Unity Fest that draws thousands of people to a festival that is held in Van Ness Park, connecting people with health providers, departments that deliver city services, organizations that represent the stakeholders, and the history of the community, all as an expression of Unity.